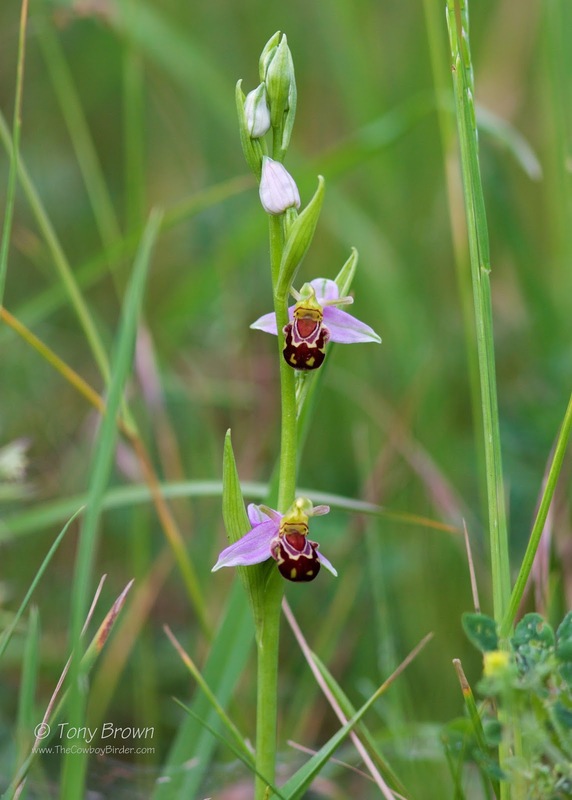 The Cowboy Birder: Bee Orchids - Green stuff rules! "Dad - where are you going"? "I'm just going to see a locally rare flower". "Well, at least it won't fly away"! And for the 2nd blogpost running the green stuff has put in an appearance on these pages, but no excuses for covering them with wonderful images of Bee Orchids. 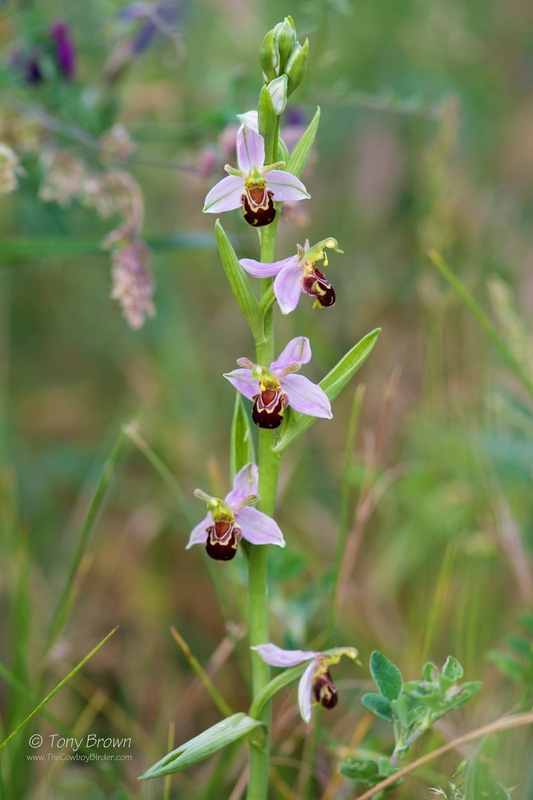 Mr Wanstead Bio-blitz (Tim Harris) found these exquisite Bee Orchids in the outer reaches of Wanstead Flats - just off a main pathway and close to a main road. I can see why they could be easily be overlooked - it took me over twenty minutes to find them and that was despite knowing the OS grid reference and included an additional telephone call to get precise directions, but I'm so glad I made the effort - I'm now hoping to make it a hatrick of green stuff posts by ditching the bins at the weekend and finding my own rare flower! The Wren Wildlife Group's second annual bio-blitz will take place this month, giving Wanstead residents of all ages the chance to learn more about local flora and fauna. The weekend of free activities kicks off with a night-time bat walk in Wanstead Park on 24 June. 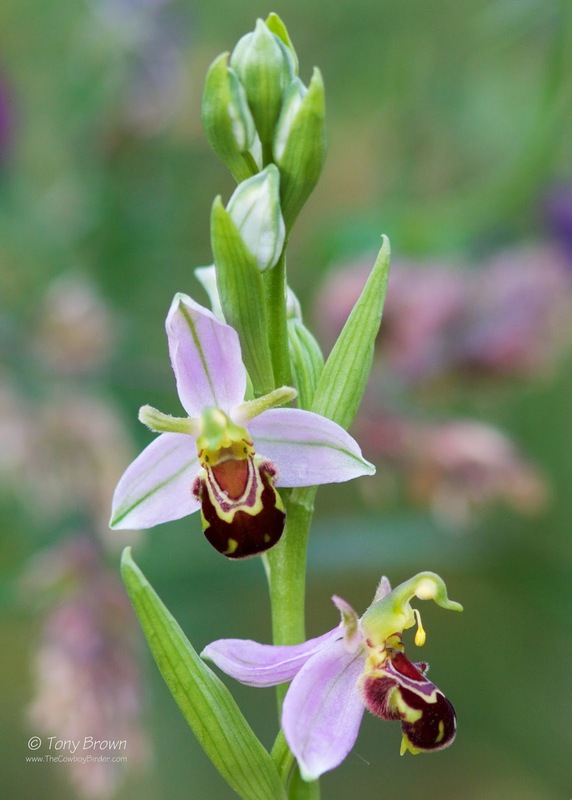 Local botanist Tricia Moxey will lead two walks – one on Wanstead Flats (25 June) and one in the park (26 June) – looking at trees, wildflowers and insects. A dawn chorus birdwatching walk led by Nick Croft will also take place in the park from 5am on 26 June, meeting at the riding stables in Empress Avenue. More information can be found on the Wren Group website. You're not wrong Steve, even a green stuff mocker like myself was bowled over by them - I might have to start an Orchid list!